New FEC for Al Maghribia on 11257.61MHz, pol.H: FEC:5/6 ( SR:27500 SID:404 PID:641/642 Arabic - Clear). Al Maghribia switched to DVB-S2 at 11257.61MHz, pol.H SR:27500 FEC:5/6 PID:641/642 Arabic. 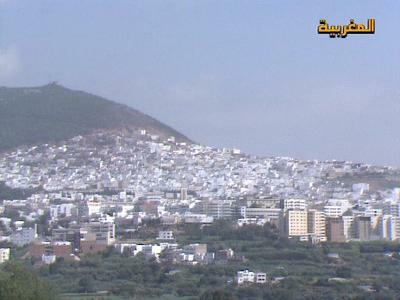 A new channel has started in DVB-S2 Irdeto 2: Al Maghribia (Morocco) on 10758.00MHz, pol.V SR:27500 FEC:5/6 SID:210 PID:2101[H.265]/2102 Arabic. New frequency for Al Maghribia: 11257.61MHz, pol.H (DVB-S SR:27500 FEC:5/6 SID:404 PID:641/642 Arabic- Clear). New frequency for Al Maghribia: 11823.00MHz, pol.V (DVB-S SR:27500 FEC:5/6 SID:1104 PID:1005/1007 Arabic- Clear). A new channel has started in DVB-S Clear: Al Maghribia (Morocco) on 12188.00MHz, pol.H SR:27500 FEC:5/6 SID:1104 PID:1005/1007 English. New frequency for Al Maghribia: 11476.00MHz, pol.V (DVB-S SR:27500 FEC:3/4 SID:5 PID:501/502 Arabic French- Clear). New PID for Al Maghribia: PID:308/309 Arabic French SID:1 (10873.00MHz, pol.V SR:27500 FEC:3/4 - Clear). New PID for Al Maghribia: PID:309/308 Arabic French SID:1 (10873.00MHz, pol.V SR:27500 FEC:3/4 - Clear). New PID for Al Maghribia: PID:5001/5002 Arabic SID:50 (12682.00MHz, pol.V SR:27500 FEC:3/4 - Clear). Al Maghribia switched to Nilesat 201 satellite at 11823.00MHz, pol.V (DVB-S , 11823.00MHz, pol.V SR:27500 FEC:5/6 PID:1005/1007 Arabic French). New frequency for Al Maghribia: 11642.00MHz, pol.H (DVB-S SR:27500 FEC:3/4 SID:10625 PID:1251/1252 Arabic French- Clear). New SID for Al Maghribia on 3727.00MHz, pol.R FEC:7/8 SR:29950: SID:904 ( PID:3040/3041 Arabic - Clear). A new channel has started in DVB-S Clear: Al Maghribia (Morocco) on 12682.00MHz, pol.V SR:27500 FEC:3/4 SID:50 PID:5002/5003 French Arabic. Al Maghribia (Morocco) broadcasts in DVB-S Clear on 3727.00MHz, pol.R SR:29950 FEC:7/8 SID:902 PID:3040/3041 Arabic. A new channel has started in DVB-S2 Clear: Al Maghribia (Morocco) on 11477.00MHz, pol.H SR:15707 FEC:3/4 SID:10 PID:2562/2564 Arabic French,2566. New frequency for Al Maghribia: 11296.00MHz, pol.H (DVB-S SR:27500 FEC:5/6 SID:1104 PID:1005/1007 Arabic French- Clear). A new channel has started in DVB-S Clear: Al Maghribia (Morocco) on 11843.00MHz, pol.H SR:27500 FEC:5/6 SID:615 PID:3003/3004 Arabic. Al Maghribia (Morocco) broadcasts in DVB-S Clear on 11843.00MHz, pol.H SR:27500 FEC:5/6 SID:615 PID:3003/3004 Arabic. New frequency for Al Maghribia: 11977.00MHz, pol.V (DVB-S SR:27500 FEC:3/4 SID:7 PID:4880/4881 Arabic French- Clear). New FEC for Al Maghribia on 11823.00MHz, pol.V: FEC:5/6 ( SR:27500 SID:1104 PID:1005/1007 Arabic French - Clear). New frequency for Al Maghribia: 11766.00MHz, pol.H (DVB-S SR:27500 FEC:3/4 SID:5 PID:1560/1520 Arabic- Clear). Al Maghribia switched to Hot Bird 13C satellite at 12673.00MHz, pol.V (DVB-S , 12673.00MHz, pol.V SR:27500 FEC:3/4 PID:308/309 French). New frequency for Al Maghribia: 10873.00MHz, pol.V (DVB-S SR:27500 FEC:3/4 SID:1 PID:308/309 French- Clear). Al Maghribia is back on 11727.00MHz, pol.V SR:27500 FEC:3/4 SID:13730 after a break ( PID:2831/2832 Arabic - Clear). New SID for Al Maghribia on 12673.00MHz, pol.V FEC:3/4 SR:27500: SID:1 ( PID:308/309 Arabic - Clear). New PID for Al Maghribia: PID:48/49 Arabic SID:4201 (12673.00MHz, pol.V SR:27500 FEC:3/4 - Clear). New frequency for Al Maghribia: 12673.00MHz, pol.V (DVB-S SR:27500 FEC:3/4 SID:4201 PID:308/256 Arabic- Clear). New SR for Al Maghribia on 11011.00MHz, pol.V: SR:13020 ( FEC:2/3 SID:1 PID:258/259 - Clear). A new channel has started in DVB-S Clear: Al Maghribia (Morocco) on 11823.00MHz, pol.V SR:27500 FEC:3/4 SID:1104 PID:1005/1007 Arabic French. A new channel has started in DVB-S Clear: Al Maghribia (Morocco) on 11010.00MHz, pol.V SR:5632 FEC:3/4 SID:1 PID:258/259. A new channel has started in DVB-S Clear: Al Maghribia (Morocco) on 11727.00MHz, pol.V SR:27500 FEC:3/4 SID:13730 PID:2731/2732 Arabic. A testcard identified Al Maghribia has started in Clear on 11727.00MHz, pol.V SR:27500 FEC:3/4 SID:13730 PID:2731/2732 Arabic. A testcard identified Al Maghribia has started in Clear on 11010.00MHz, pol.V SR:5632 FEC:3/4 SID:1 PID:258/259. Al Maghribia has left 11938.00MHz, pol.V (DVB-S SID:509 PID:3160/3120 Arabic), it is no longer transmitted by satellite in Europe. A new channel has started in DVB-S Clear: Al Maghribia (Morocco) on 11938.00MHz, pol.V SR:27500 FEC:3/4 SID:509 PID:3160/3120 Arabic.